What Does It Mean if Your Puppy Keeps Licking Its Privates? It's time for a checkup if your pooch keeps licking her privates. It may seem unsavory to you, but your puppy instinctively licks her privates on occasion as part of her self-care regimen. If she's doing so excessively -- more than a brief cleaning or two per day -- something may be amiss. It's time for a visit to your vet's office. It's not uncommon for a puppy to experience some difficulty controlling her bladder. However, actual urinary incontinence is a health concern. Along with frequently licking her privates, if incontinence is an issue, your fuzzy little friend also may leave behind pee puddles, trails of urine or have damp fur or irritation around her urinary opening. Other lower urinary tract problems can prompt your pooch to lick herself in the genital area. She may be tending to discharge or dampness, trying to soothe itchy or irritated skin or reacting to pain, since she really has no other recourse. Urinary tract infections are a common culprit. Bladder or other urinary tract stones are less likely in young pups, but are always a possibility. Crystal formations or other debris sometimes accumulates in the urine, causing discomfort or pain. Obstruction of the urethra is a dangerous condition that also may trigger excessive licking. The various urinary tract problems your four-legged friend may be experiencing have an array of underlying causes. Obviously, getting to the bottom of things is necessary to figure out the best course of treatment. Possible causes of incontinence, genital discharge and other lower urinary tract conditions include hormonal imbalances, neurological or anatomical disorders, congenital defects, diabetes, prostate or kidney dysfunction, trauma, neoplasia and other cancers, stress, medication side effects and more. One urinary tract problem can cause another as a symptom. For example UTIs or bladder stones may cause incontinence or genital discharge. 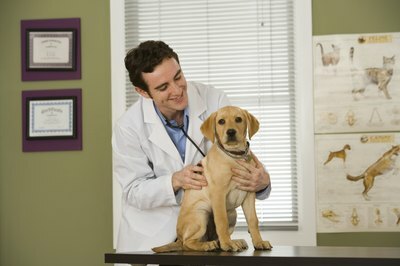 Work with your vet to determine a diagnosis. It's possible your canine companion's excessive genital licking is obsessive-compulsive. If there's no physical cause, she does it to an extreme degree or becomes hyper-focused on the task, that's probably what's going on. Such behaviors usually begin in young dogs who are understimulated and bored, or they're a side effect of stress or anxiety. Of course, your pet may appear to be licking obsessively when there is itchiness or pain. In addition to lower urinary tract conditions, parasites around her genital area, food allergies or skin conditions and a foreign object lodged in or around her privates are potential sources of discomfort that can trigger excessive licking. Is Cat Litter Harmful to Pregnant Women?